What's the difference between dead and living capital? How can you tell them apart? Common examples of living capital metrics include the measures of length and width used in land surveys, measures of weight used in grocery store produce departments, or kilowatts, bushels, or barrels. All of the capital metrics in common economic use facilitate fair trade by providing uniform measures of constant amounts. These measures do not change just because a different brand or make of instrument is used, or just because a different person uses and reads the instrument, or just because a different sample is measured or it is a different day of the week. Fair measures are widely recognized as essential to economic justice. They are called for in the Bible, the Torah, and the Koran, and in the Magna Carta and the U. S. Constitution. Living capital metrics align with amounts of the thing measured. Before the French Revolution, weights and measures varied widely in Western Europe. It sometimes happened that the same unit amount would have different names in different places, and different unit amounts would have the same names. Unscrupulous nobles and merchants would cheat the populace in taxation and trade by using one set of weights to buy with, and another to sell with. The System Internationale emerged as a result of one of the consistently requested demands made in the French Revolution: reform of the system of weights and measures. Living capital metrics add up the way the thing measured does. Imagine measuring in both inches and centimeters the lengths of a large group of different objects. A plot of these pairs of measures would result in a figure like that shown above. 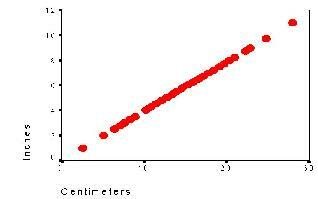 Each dot in the figure represents the length of one object. We take it for granted that lengths measured in inches are the same as lengths measured in centimeters, and that only the number systems and their relative degrees of acceptance and convenience differ. The dots in the figure above all fall on the identity line because the amounts of length of the things measured completely dominates the relation of inches to centimeters. The same kind of plot would be produced if we compared measures made from different centimeter rulers, or from different inch rulers. And the same kinds of plots would result from comparisons of grams vs. ounces, degrees Celsius vs. Fahrenheit, barrels vs. gallons vs. liters, etc. Fair, just, and scientifically calibrated measures are obviously essential to economic success. They are so important that we invest significant effort in legal metrology, and in setting and maintaining standards. But dead capital metrics, by definition, do not serve the purposes of investment management because the thing measured does not add up the way the numbers do. The figure to the right shows what happens in comparisons of sums of ratings from the kinds of instruments used to measure human, social, and natural capital. The numbers derived from different instruments that are supposed to measure the same thing are not dominated by constant amounts. Any given unit difference on one instrument corresponds with a different unit difference on the other instrument. 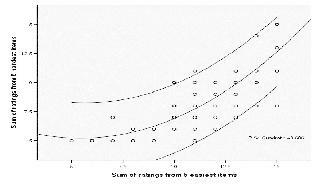 The same curved relationship results when percents of the maximum total score are used instead of the summed ratings. But this does not need to be the case. 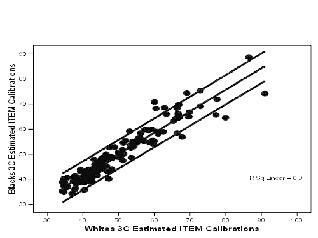 Proven methods of instrument calibration have been used in high stakes testing and health care research globally for years. These methods can be used to produce living metrics that reproduce the comparability of rigorous scientific precision measurement for nontraditional, intangible forms of capital. The three figures at the bottom of the page show the kinds of comparisons that can be supported when proper care is taken in the instrument design, data gathering, and analysis. The first of these figures shows that completely different sets of items, drawn from a common pool of items designed to measure the same thing, can produce the same measures in the same unit. 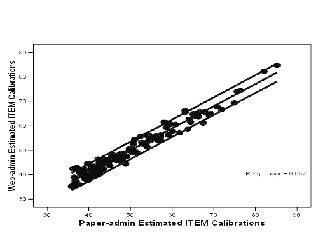 The second and third figures show that completely different survey respondents, drawn from a common population, can produce the same calibrations in the same unit, even when the survey is administered in different modes (in this case, via the web vs. paper-and-pencil). Living human, social, and natural capital metrics will be of vital importance in supporting the needs of consumers making purchasing decisions, managers making staffing decisions, quality assessors making improvement decisions, investors making financing decisions, and judges making legal decisions. Technical reference standards have been essential to the emergence of new market economies at each stage in their development, from local to regional to global. When we can all think together in the common languages of the things we want to nurture and grow, we will be better able to marshall our collective intelligence and energy for the purposes of creating sustainable livelihoods for ourselves and the generations to come. Percents and summed ratings do not provide the quality of measurement needed for effective capital management. Completely different rating scale instruments, same measures. Different survey respondents and different mode of survey administration, same item calibrations for the instrument: a living capital metric. Completely different sets of survey respondents, same item calibrations for the instrument.